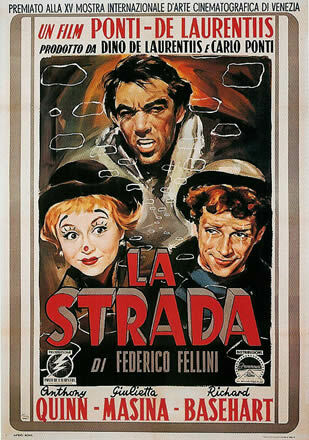 On Monday 30.11. we went to watch a movie called la strada that waas mide by Federico Fellini in Italy, 1954. The main actors were Anthony Quinn, Giluetta Masina and Richard Basehart. This movie tells about a couple going around doing circus tricks to earn some money. The couples names are Young Gelsomina and Zampanó. The only trick I remember seeing in their sircus was that Zampano is putting an iron chain on his chest and flexing his muscles to break it which is showing off his incredible muscle strength. There was another trick and it was Gelsomina playing a song with a trumpet. This couple did have some problems though, Gelsomina starts to complain to Zampano on the poor treatment she is receiving and so she leaves. After a little bit of time Zampano finds her again and they start performing. In one of the circus events a man comes and tries to take Gelsomina to his side and Zampano is a very aggressive person and so he starts punching him and actually kills him on accident. Gelsomina cant get this off her mind and is very unpleased with Zampano and keeps on reminding about this incident to Zampano, then Zampano leaves and later regrets this but he will never get her back. I think this movie was just a little bit lower then average because of the not so pleasing plot and the disturbing, boring moments. I would say that this movie should be from age groups 20- 100. The genre must of been some kind of adventure I think. From 1-10 I would give this movie a 3.